IC Insights forecasts that China-headquartered companies will spend USD 11.0 billion in semiconductor industry capex in 2018, which would represent 10.6% of the expected worldwide outlays of USD 103.5 billion. 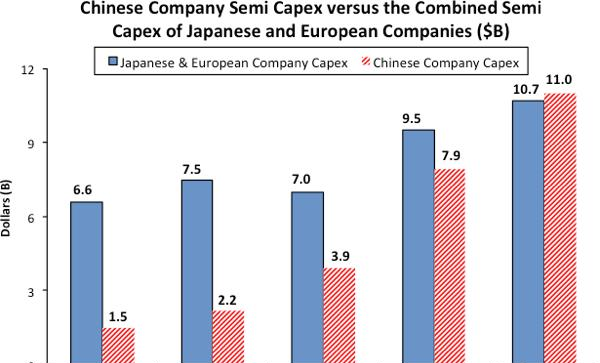 Not only would this amount be 5x what the Chinese companies spent only three years earlier in 2015, but it would also exceed the combined semiconductor industry capital spending of Japan- and Europe-headquartered companies this year. Since adopting the fab-lite business model, the three major European producers have represented a very small share of total semiconductor industry capital expenditures and are forecast to account for only 4% of global spending in 2018 after representing 8% of worldwide capex in 2005. Although there may be an occasional spike in capital spending from European companies (e.g., the surge in spending from ST and AMS in 2017), IC Insights believes that Europe-headquartered companies will represent only 3% of worldwide semiconductor capital expenditures in 2022. It should be noted that several Japanese semiconductor companies have also transitioned to a fab-lite business model (e.g., Renesas, Sony, etc.). With strong competition reducing the number and strength of Japanese semiconductor manufacturers, the loss of its vertically integrated businesses and thus missing out on supplying devices for several high-volume end-use applications, and its collective shift toward fab-lite business models, Japanese companies have greatly reduced their investment in new wafer fabs and equipment. In fact, Japanese companies are forecast to represent only 6% of total semiconductor industry capital expenditures in 2018, a big decline from the 22% share they held in 2005 and an even more precipitous drop from the 51% share they held in 1990. Although China-headquartered pure-play foundry SMIC has been part of the list of major semiconductor industry capital spenders for quite some time, there are four additional Chinese companies that are forecast to become significant semiconductor industry spenders this year and next—memory suppliers XMC/YMTC, Innotron, JHICC, and pure-play foundry Shanghai Huali. Each of these companies is expected to spend a considerable amount of money equipping and ramping up their new fabs in 2018 and 2019. Due to the increased spending by startup China-based memory manufacturers, IC Insights believes that the Asia-Pac/Others share of semiconductor industry capital spending will remain over 60% for at least the next couple of years.